The subtitle of this book is "an [unlikely] theory of globalization", and I suppose if you want to take the book at it's face value, it's a failure. Foer fails to explain the globalization except in a general, cliche driven, sense. 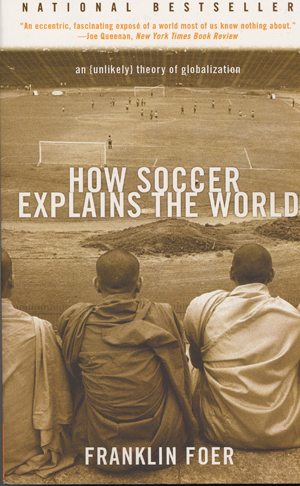 And many reviewers have rightfully taken him to task on this, as it really seems like the link between "globalization" and soccer is tenuous at best. However, this should not detract from the value of Foer's writings, as his 10 essays are for the most part quite interesting. To be sure, these are personal stories of his interest, but for the most part, he does a reasonable job. Gangsters (Red Star, Obilic), Sectarianism (Rangers), Jews (MTK Budapest, Ajax, Spurs), Hooligans (Chelsea), Corruption (Brazil), cheap labour (Africans in Ukraine), Rich SOBs (Milan), Nationalism (Barcelona), Islam (Iran) and "Culture Wars" (US). Obviously, some of these chapters are better than others, although by and large, they are all worth reading. The chapter on the US is actually quite intriguing, as Foer offers some interesting observations on the nature of the game in America, and some of the obstacles that it faces. For most American soccer fans, these would be obvious, but for non-Americans it offers some insight into the state of the game here.